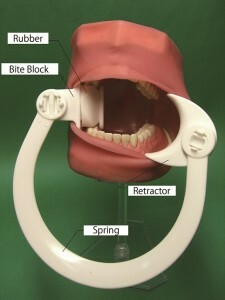 Keep lip pulled with Bite Block. Broad view & Space for various treatments. 4 patterns available for every treated area. Comfortable for patient by Bite Block with Silicone & Retractor in Polypropylene. Fit lip well by adjustable Retractor. Autoclabable at 121 degrees centigrade without drying process.